When I think about summer – I think about the 4th of July – fireworks, parades, picnics, flags - it was my absolute favorite holiday when I was growing up (now it is a close second behind Thanksgiving). During my entire life, and pretty much up until this day – this is what we eat on the 4th of July. My grandmas barbecue hamburgers. They would always be in a pot on the stove ready for anyone to enjoy. Along with some traditional potato salad or tuna salad, chips and a pop – this is the essence of summer for me. Luckily this is one of my grandmas recipes that she had written down, since she is no longer with us anymore. So when I eat these I think about her and am reminded of my childhood. Just a note – these are not ‘traditional’ bbq sauce taste that some might expect. It is a very simple, tomato based sauce – flavored with a bit of Worcestershire sauce. They are truly nostalgic to me – I hope you enjoy them! 1. Combine tomato sauce, can of water, Worcestershire sauce in a medium sized pot and bring to a simmer. 2. Combine beef, onion, salt and pepper in a large bowl. 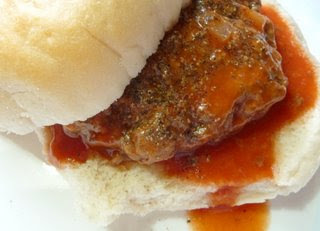 Quickly dip the slice of bread in the tomato sauce – and add that you the beef mixture. 3. Form beef mixture into 8 equal patties. Working in batches pan fry the hamburger patties. 4. Thicken the tomato sauce with flour and whisk to combine. 5. Add cooked burgers to the tomato sauce, and simmer on the stove. 6. Serve on buns with extra sauce and season with salt and pepper. Source: family recipe – Grandma R.